Four easy steps to revamping your garden furniture for 2015! Originally the fencing, raised bed, sleepers and tables were stained dark walnut, but this has faded over time as often happens in South facing spaces. I popped into B&Q for some of the Valspar Garden range, choosing a deep grey called Evening Coat and a sunshine yellow named English Primrose. The existing walnut shade has always looked great with the deep grey of the natural slate path in the middle of the garden so in effect all I’m doing is tipping the balance to reflect 2015 colour trends – achieving more grey than brown, plus adding in a bit of zing with the bright yellow! 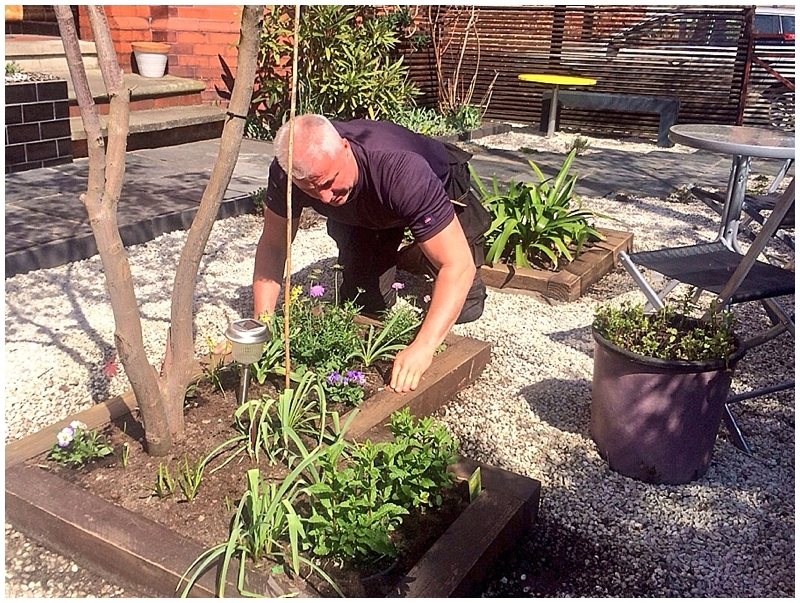 I brushed down the chairs of dust and dirt, and gently brushed any soil away from the raised bed tops and sides. 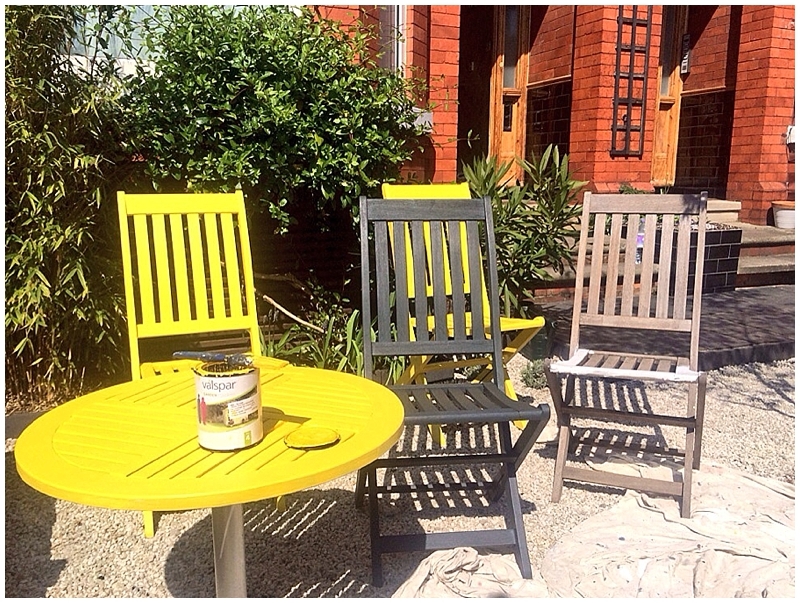 I used a white water-based undercoat on the chairs which were to be painted yellow to get a cleaner colour base for such a bright yellow, but a grey for the chairs to be painted the dark colour. Using a white undercoat under dark top coats may mean you need more top coats to get a solid colour, which is a bit wasteful. Time for the top coats! 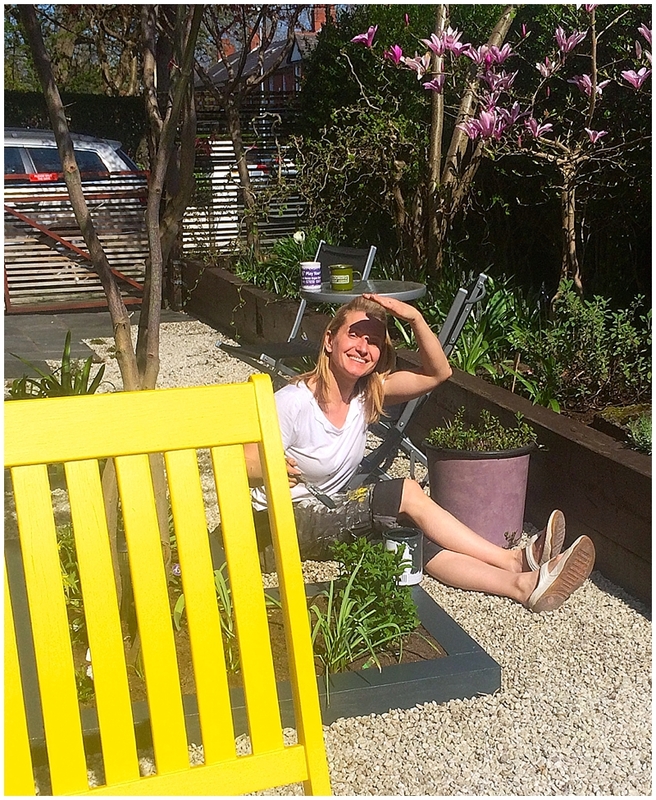 The grey coverage was fab – I used two coats on our benches, raised beds and two of the chairs but colourwise there was a solid grey after one coat. Yellows are notoriously tough to get solid coverage one but again two coats pretty much did the trick for both my table tops and two chairs. Easy to use, a nice consistency and very fast drying – watch out for those drips! I bought 1L of yellow and have half a tin left after two chairs and two table tops, but used all my 1L of grey as that did benches and beds too. The coverage is good, colour depth excellent and I’d buy it again at £15 per 1L. Painting the existing wood has brightened up the garden a treat and given it contemporary twist for 2015. I was delighted to hear that our Airbnb guests in the building were sitting out within the hour drinking wine & having a takeaway. It’s a good job that paint was fast drying!! They look excellent – well done. My chap is making a vertical pallet garden at the moment (for lettuce etc) It’s going to be painted sea green.